Seven men, masquerading as police officers, entered a home on the 8400 block of San Gregorio in Atascadero Saturday and restrained and robbed the people inside, police said. Early Saturday morning, the suspects held the victims at gunpoint while they restrained them. 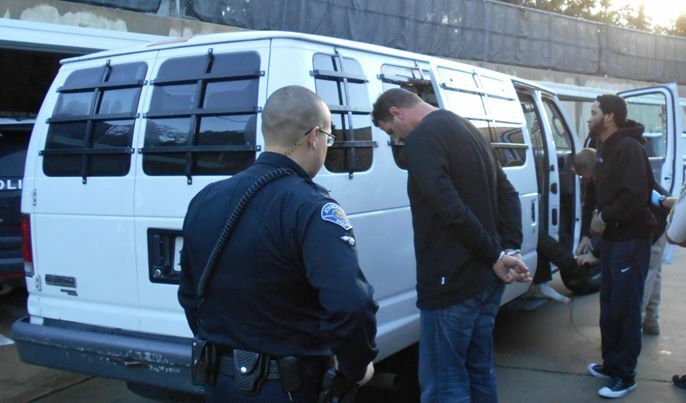 The suspects, all from out of San Luis Obispo County, then stole a large amount of cash and other property. At about 2:30 a.m., after the robbers left the scene, one of the victims was able to free himself from his restraints and call 911. Police believe the suspects specifically targeted the residence. Sources tell CalCoastNews the robbers also snatched 100 pounds of medical marijuana. The investigation is ongoing and the suspects are facing additional charges, police said. Police arrested the suspects for first degree robbery and booked them into the San Luis Obispo County Jail, each with a $100,000 bail. Maybe we should get rid of banks due to a robbery that might occur. Large quantities of money might intrigue them. Or any place with a cash register. Happens all the time in NORTH CALI , nothing new just happened in paso on whispering oak way , CA VALLEY is the next place for drug crimes to occur , been going on for 30 years on hwy 58 east of margarita, CRESTON has had its share over the years on the side roads , drugs , chop shops etc we just dont hear about it in the news most of the time .Not good for property values, tourism , etc . property taxes gotta keep those land values up ! Crime of all types is mostly going up in places that are governed by democrats. The liberal form of governance is a flawed and dangerous experiment that unfortunately is going to ruin this once great state. The left has a predisposition to believe the criminals over the police and citizens…it’s in there DNA. That’s why they support Illegal Immigrants, Radical Islamists and Murderers. It wasn’t “their fault” it was the White Hertopatriarchy USA Culture that made them do it. What a bunch of tripe. Yes this liberal form of governance, a representational republic, is a flawed and dangerous experiment. Just ask the founding father’s. They had people like you, exposing similar beliefs, then too. How about having a discussion, related to the topic, that is substantive. Yes, liberals love crime–you’re deep analysis has exposed us!! Thumbs up across the board. Well this liberal would like our representatives in government to catch up. We’ve “liberalized” the marijuana laws but our representatives (and law enforcement to some extent) have acted at a snails pace to institute common sense measures to manage this new found reality. This CRIMINAL act is the result of our representative’s not doing their job-zoning, enforcing, and establishing “accepted common practices” as it relates to the marijuana industry. These guys came to pop a growing establishment for the weed and money. Just like bank robbers go to banks, and druggies knock over pharmacies. By pretending to that the new marijuana laws don’t exist–and not zoning for the growth-sale-and processing of the material we’re left dealing with these pot production “islands” that pop up in residential neighborhoods. This is primarily due to the absence of sensible marijuana laws. Personally I’d prefer these operations out in the open, in designated areas, and regulated. Not dealing with this new reality will lead to more and more people operating industrialized growing operations within their residences. This location was off San Gregorio Rd. In a heavily wooded neighborhood. High powered Halogen lights, ventilation systems, fertilizers, all are part of this new industry. Yelling Liberal doesn’t make this go away. Representatives do your job. Require marijuana established businesses to operate in areas appropriate for such use–and inspect them regularly. If not there will be other such “home” invasions, or fires, or chemical dumping in your backyard. BTW–California rocks, always has always will. We’re the tip of the spear, and like it that way. Often I disagree with MrYan, especially when he says not to talk about something, then talks about it himself (lol?). Anyway, I believe he is correct here in that we do need to establish an infrastructure (and if anyone knows me, I am NEVER for more government), but we have laws and regulations regarding the production of alcohol, we need similar ones for marijuana. Also, like alcohol, there can be a “maximum” amount for personal use (e.g. homebrew rules, passed down from Christianity, of all things – altar wine was made in the parish, ergo, we’re allowed to make 1-2 gallons personal use per year or something like that). Once that is established, allowing home-growers their freedom, while also regulating full-on production, we may see a decrease in potential pot-house crimes (and an increase in pot costs, no doubt). However, MrYan, I would not hold my breath for our “Representatives” to do their job, as most of them are severely unqualified, as most only have experience in government (which, outside of government, is basically useless). Unfortunately, it will be the Monsanto (hello, George Soros) of pot that will ram the regulations through benefiting them, and whatever clown they have on the payroll will blindly support / sign / sponsor the “legislation” to benefit the major producers.